If you are like the owners of the charming villa La Dacha in the Falaise des Oiseaux area of St. Martin, you are interested in a visit because of the unique atmosphere of the island. With a Dutch and a French side, the owners found that they loved its feel – especially the French side. Visiting the island for more than two decades, they say they appreciate it because the French side has “all the trappings of South of France with wonderful Caribbean flavor.” If you have been island hopping in search of that same balance “great food, French flair, beautiful beaches and vibrant nature”, St. Martin, and particularly villa La Dacha are for you. This is important because the property is actually along the northern coast of the Terres Basses area of the island. This means you get to savor amazing views across the water as well as guaranteed sunsets each evening. 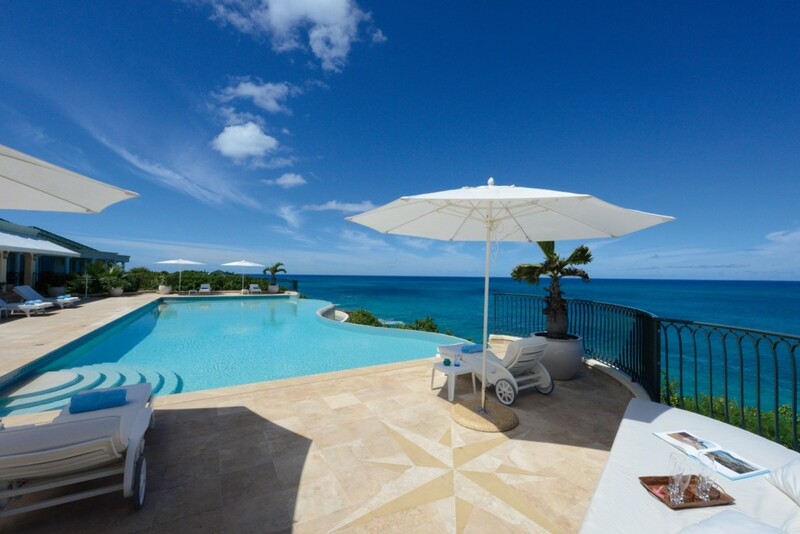 With a premium placed on outdoor living, this makes the villa an amazing find for those who have done their homework or know of the joys of St. Martin’s weather and scenery. 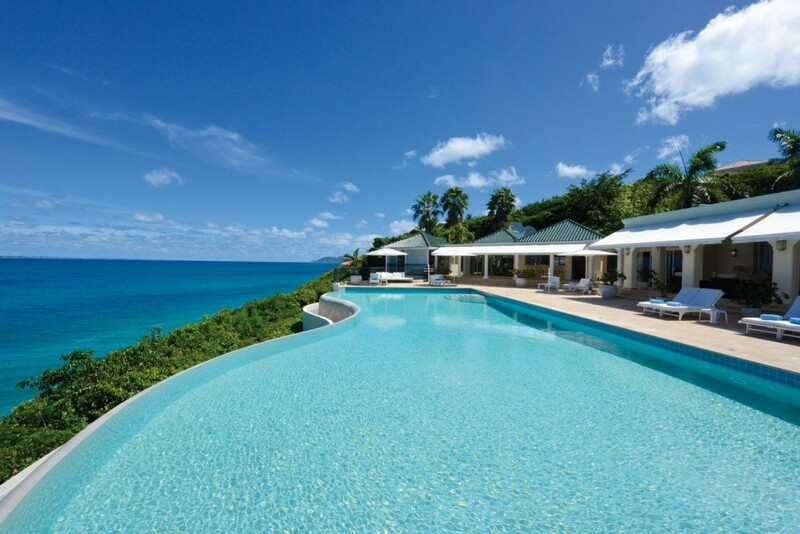 A massive pool terrace runs along the edge of the verandah, leading the eye into the views. 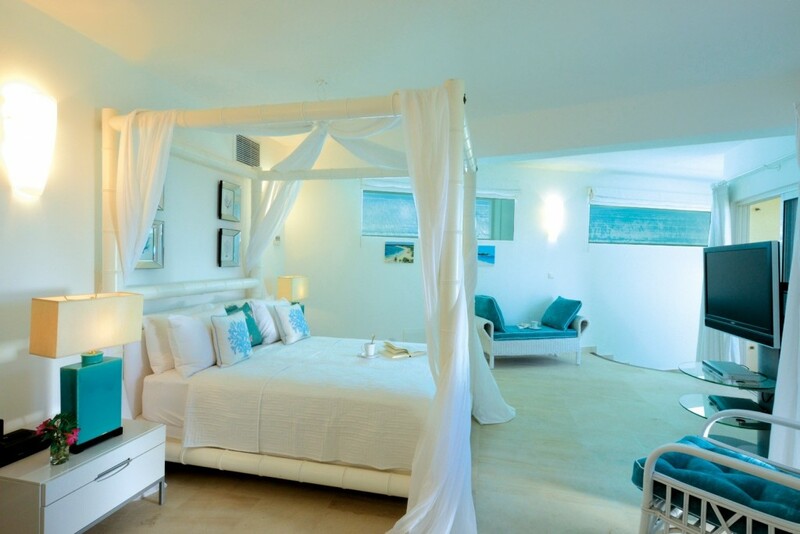 Furnished with large sun beds and lounging areas, it provides an ideal space for stargazing in addition to swimming. The interiors are the work of Geoffrey Bradfield, a world-renown designer from New York City. Having done work all over the world he was able to create a remarkably unique and global setting throughout. Mosaic tile floors and Moorish arches in one of the sitting areas open into a sea green and white great room with columns and rich turquoise upholstery that captures the same hues as you see through any door or window. A great room with rattan pieces and a tropical green palette makes for casual living at all times. Even the game room is a dreamy expanse of scenery and spaciousness. Any of the shared, interior spaces allow you to savor what the owners describe as “the infinity of the view from the villa, the quietude, the feeling of being far and away from hustle and bustle of everyday life”. Naturally, this is all part of the experience in one of the five different bedrooms in La Dacha as well. 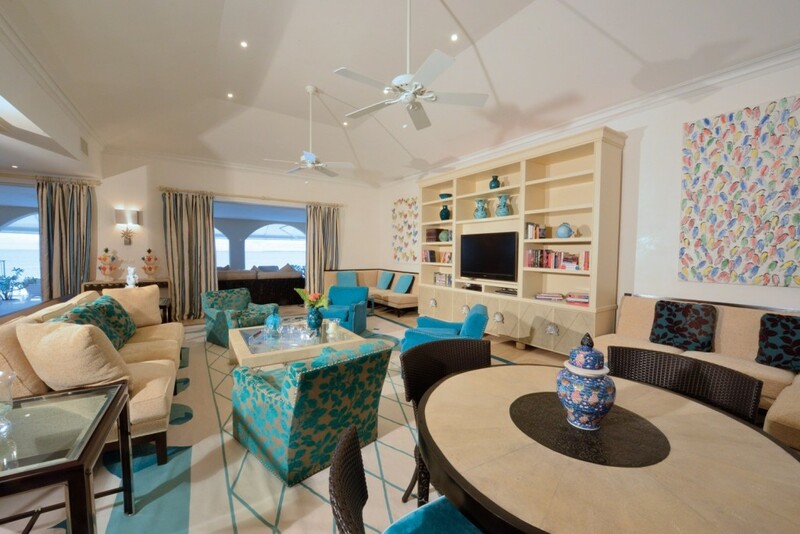 Designed with the same global influences, they include three master-styled suites and two suites suitable to kids or individuals. Each is an ensuite room with great views and outdoor showers. When asked what other experiences they would recommend to guests who have booked a visit to the villa, their answer is a short and hilarious one: “Don’t leave the villa.” With its gorgeous and beautifully designed interiors, its wonderful location, its spaciousness and wide array of indoor and outdoor living spaces, you may come to agree with them and decide that the villa La Dacha is a perfect destination for your next holiday in St. Martin.